Parents, pleeeaaase don’t let your kids go to school with their cell phones! Here’s what you’re allowing to happen to them when you do. I know this because they tell me all the time. They have a very hard time keeping on task. Concentrating on boring schoolwork is tough. Phones tempt children to text one another in class, peek on Facebook, look things up on Google, and even cheat on their work. You give creepy people full access to your son or daughter. Thousands upon thousands of people—many of whom have awful intentions—can access your son or daughter and see what they’re doing. If you don’t believe me, ask your local police office. School Internet filters aren’t always good enough, so don’t rely on those. You’re breaking a strong command that God issued us. “Lead us not into temptation” is part of the Lord’s Prayer. And Christ tells us in Matthew 26 to “watch and pray” so that we may not enter into temptation. 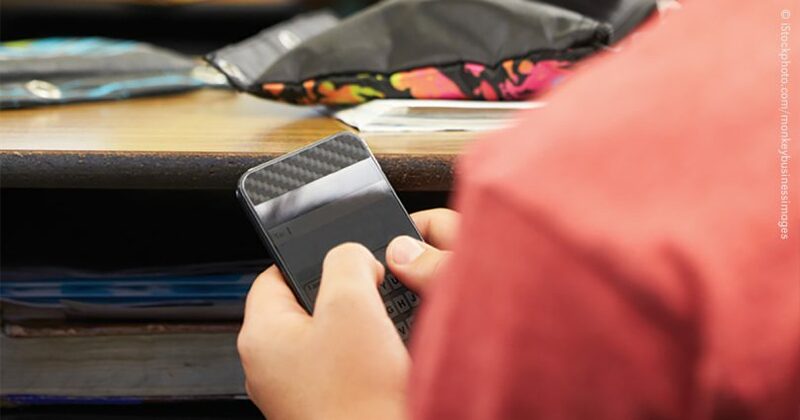 When you send the cell phone to school, aren’t you directly leading your son into temptation? He’ll be distracted from his work, and tempted to gossip online or look at tawdry things, for starters. You show disrespect to your child’s teacher. By letting your daughter bring her phone, you’re allowing her to turn her attention from her studies to her phone. This is outright rude to her teachers. You increase your child’s frustration level tenfold. Even an 18-year-old is cognitively immature, and has real difficulty making his body and mind do what he really wants them to do. He relies on you to help him with this. This means limiting things (such as cell phone use) that sabotage his efforts to succeed. You encourage him to bend to peer pressure. You encourage your son to live in a world that is isolated from the family. Cell phones and computers allow our kids to live in worlds we can’t see. When we give them more frequent access to this private world, this is not only dangerous, but it also drives a wedge between us and them. Cell phones going to school with your child or teenager bring nothing but trouble, so take a tough stand. I promise, one day your son or daughter will thank you. And so will their teachers. Dr. Meg Meeker is a pediatrician, mother of four, best-selling author of six books, and the country’s leading authority on parenting, teens, and children’s health. She has practiced pediatric and adolescent medicine for 25 years while also helping parents and teens to communicate more deeply about difficult topics. Her work with countless families served as the inspiration behind her new, groundbreaking book, The Ten Habits of Happy Mothers: Reclaiming Our Passion, Purpose and Sanity. Dr. Meg has spoken nationally on teen health issues, and has made numerous appearances on nationally syndicated radio and TV programs. This article was originally published by MegMeekerMD.com, and has been abridged and reprinted with permission.